The first time I heard of a Maacher Jhuri was from Ushnish da's blog post. 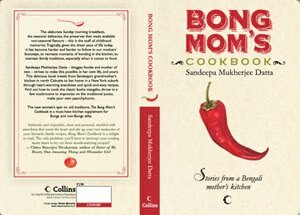 His was the classic recipe with Loitya Maach aka Bombay Duck. 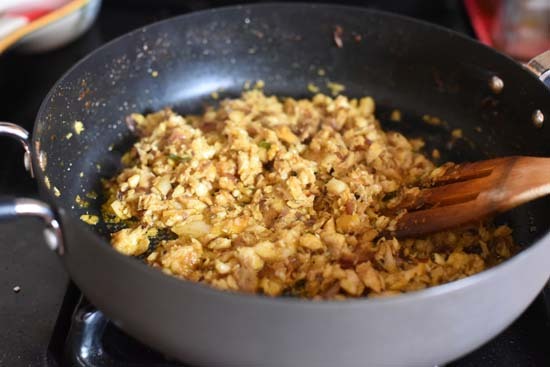 Loitya Maach was not a fish that was cooked in our home and I was not familiar with this preparation of Maacher Jhuri. "The origin of the term "Bombay duck" is as interesting as uncertain. One popular etymology relates to railways. When the rail links started on the Indian subcontinent, people from eastern Bengal were made aware of the great availability of the locally prized fish on India's western coasts and began importing them by the railways. Since the smell of the dried fish was overpowering, its transportation was usually by the mail train. The Bombay Mail (or Bombay Daak) thus reeked of the fish smell and "You smell like the Bombay Daak" was a common term in use in the days of the British Raj. In Bombay, the local English speakers then called it so, but it was eventually corrupted into "Bombay duck". Nonetheless, the Oxford English Dictionary dates "Bombay duck" to at least 1850, two years before the first railroad in Bombay was constructed, making this explanation unlikely"
Maacher Bhorta was something I had tasted though. Around that time, Little Sis's babysitter, a Bangladeshi lady would stay with us during the day taking care of Li'l S. M Didi was not much of a cook and dismissed most of my requests regarding cooking, with an off handed remark about how she was a working woman back in Bangladesh and hence never wasted her time in the kitchen learning to cook a biriyani or korma. However she was very particular about the food that she ate and preferred cooking a fish dish for herself in her own typical way. Mostly she would request me to get a packet of frozen fish like kechki, mourala or loitya for her. Her typical fish dish everyday would be some kind of a jhol with onion, potatoes, tomatoes and the fish, which she put in the curry without frying it like we did. She would often make a fish curry with long slices of uchhe(bittergourd) and onion. 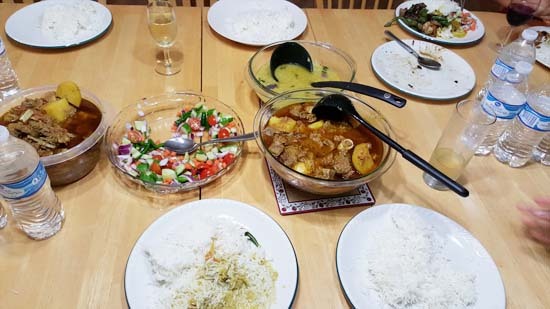 Most of her fish dishes were unlike anything we were familiar with and the husband-man, who is not a fish lover by any standard, usually stayed away from M Didi's fishy dishes. For me, the fish lover, the story would be little different. I would often succumb to those fishes and would share a little of M Didi's obscure fish curries. They were very different and I even grew a fondness for fish cooked with uchhe. 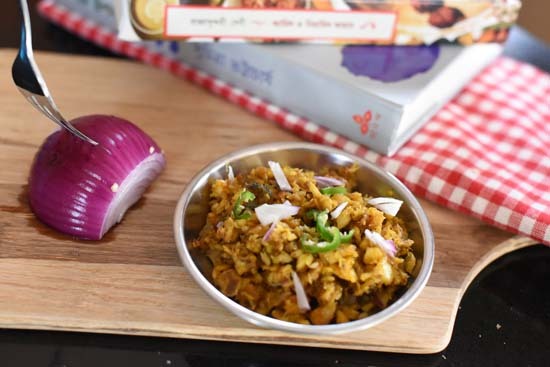 M Didi would sometimes make a "maacher bhorta" , with onion, tomatoes, garlic and lots of dhonepata and green chillis. Since she did her cooking mostly during the day and wasn't keen on discussing recipes and such stuff, I never quite found out the fish she used for her bhorta. Her bhorta was like a mashed fish and definitely very tasty. 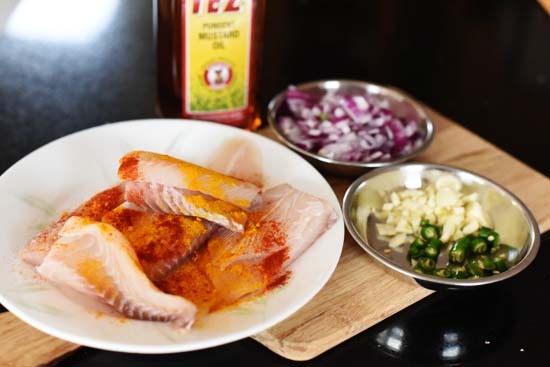 Now since we do not buy a lot of the frozen fish from Bangladeshi stores, I first tried Ushnish Da's recipe with a fish called whiting or more specifically smelt-whiting, which is found in the Asian stores. It was an instant hit at our home. More than M-Didi's bhorta, which was moist and soft in texture, my jhuri was drier, a texture both the husband and my older daughter took to. Soon after this I had a dish called "Bacalhau A Gomes De Sa" at a Portugese restaurant. It was salted cod with onions and potatoes and tasted close to the "maacher jhuri" (albeit without the umami that jhuri offers). And then a light bulb went on in my head!!! I started cooking maacher jhuri with the fish fillet like Tilapia or Flounder or Cod. I also add some shrimp for good measure. It was a dish, that is fast and easy to cook and this the most tastiest avtaar that a Tilapia fillet could ever take. I made a different kind of bati charchari yesterday, one very different from what my mother makes. She makes it mostly with potatoes chopped in long, slender, finger like slices but mine was more like this. I had green beans, cauliflower, pumpkin, potato, potato peels(aloo'r khosha), and even peels from the pumpkin.Though traditionally a bati charchari would be made in a steel container with a lid (a bati), which was then be put in a pot of boiling rice, I make it in a kadhai and it tastes just as good. With some tauk er dal with green mangoes, it was perfect for a day which showed promises of getting warmer. My grandparents lived in an old rambling house in a nondescript para(community or development) in North Calcutta (now Kolkata). The house was old, it's days of glory being long over.As appendages were added on to it and banyan trees took roots in its crevices, the house tried desperately to hold on to its rich past. In this house my maternal grandparents came to live after retirement as a part of a large "joint family", a term as rare these days as those old houses in North Calcutta. My Ma's three uncles and an aunt along with their offspring, some married some not lived under one roof, their kitchens separated but their roof united. There were some undercurrents among its residents for sure but on our annual visits every winter the whole house and the family came together and welcomed us as one. So while we watched Chitrahar and snacked on alur chop ar muri lazing around at Baro Dida's (Eldest Grandma) ornate teak bed, we ate egg roll at Ful Dida's (Flower Grandma) fancy dining table. The main meals were always at my own Dida's(my maternal grandma) kitchen though and we wouldn't give those up for anything. My Ma's aunt or pishi, C Dida, had lost her husband at an young age and lived in this house along with her four daughters. She was a proud soul and instead of being dependent on her brothers financially she worked as teacher at a nursery school and lived within her meager means to bring up her four daughters impeccably. One of her daughters pampered me a lot and so I would spend a considerable portion of my time at their room or tag along with her wherever she went. Many mornings during those vacations, I would go and sit in their small kitchen while C Dida made breakfast. Their small but squeaky clean kitchen with a shiny pump stove and minimal utensils exuded a charm that no gourmet kitchen ever has. Their breakfast too was extremely simple, left over ruti(chapati/roti) lighty fried with little oil to a wafer like crispiness was served with bati charchari. I loved that simple breakfast so much that most days I would have that sitting on their red-oxide kitchen floor, still damp & cold with early morning moisture. I don't know what makes an indelible impression in a child's heart, the stinging coldness on one's bottom, the hot off the tawa ruti mingled with the sharpness of mustard oil in a bati charchari or the love of near ones but those mornings of two and half decades back are etched in my childhood memory and bati charchari and basi ruti bhaja( fried leftover chapati/roti) is still a favorite on my food list. My Ma too would make a Bati Charchari often and the only time I would have ruti for breakfast at home was when it was accompanied by a large serving of bati charchari. 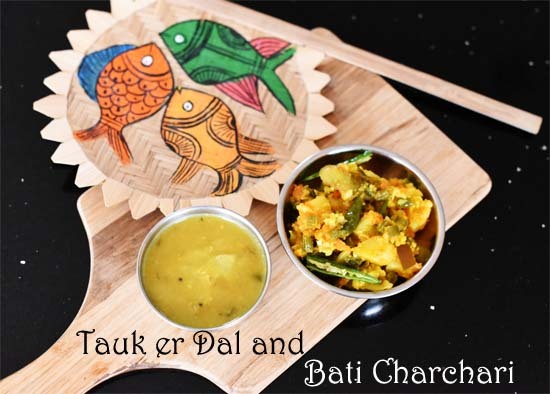 On this post the other day, a reader Boishakhi, reminded me of the delicious yet simple Bati Charchari. 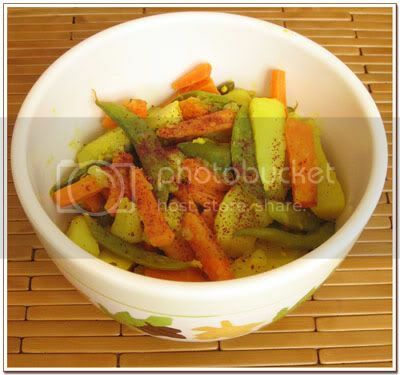 She also mentioned how she adds other vegetables to this dish. That is what I have today. 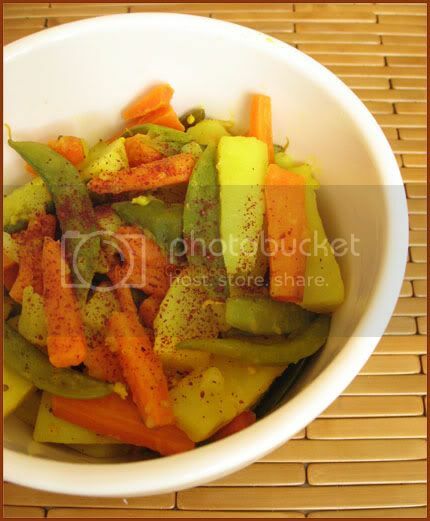 And so while my Ma's and C Dida's bati charchari had only potatoes, this has carrots and sugar snap peas in it. A sprinkle of glittering red middle eastern sumac makes the dish more international than you can imagine. Prepping the veggies: Peel and chop two medium sized potatoes in 1" long pieces. Peel and chop carrots similarly. I had about 1 and 1/2 cup of chopped carrots. Wash and keep whole 10-15 sugar snap peas. The snap peas are optional and you can use any other vegetable. I have also made this dish with a mix of green beans, cauliflower, pumpkin, potato, potato peels(aloo'r khosha), and even peels from the pumpkin Note: Ideally the vegetables for this dish should be cut thin and small, so that they all cook at the same rate. Add 1&1/2 to 2 cups of water and mix well. I sprinkled some sumac for its gorgeous color but this is totally optional as it is not a native ingredient for this dish. Note: I have not used Red Chili powder, tomatoes or coriander since my Ma wouldn't. I also went a little low on the oil. You can adjust these according to taste. 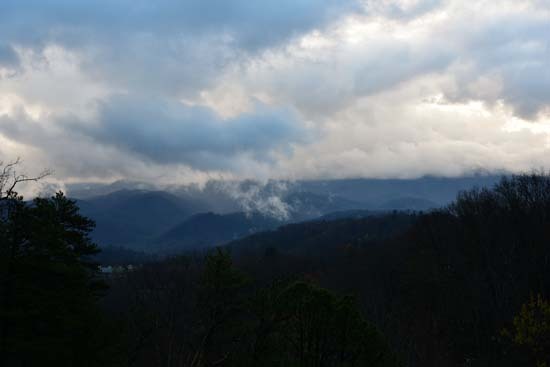 This Spring Break we went to the Smoky Mountains -- the Great Smoky Mountains. One of the few national parks in the east coast. I am a sucker for National Parks and after our Yellowstone trip last year, my secret desire is to visit all of them. Does not seem like that will happen in this lifetime with the money and time I have at my disposal but that does not mean I won't try. 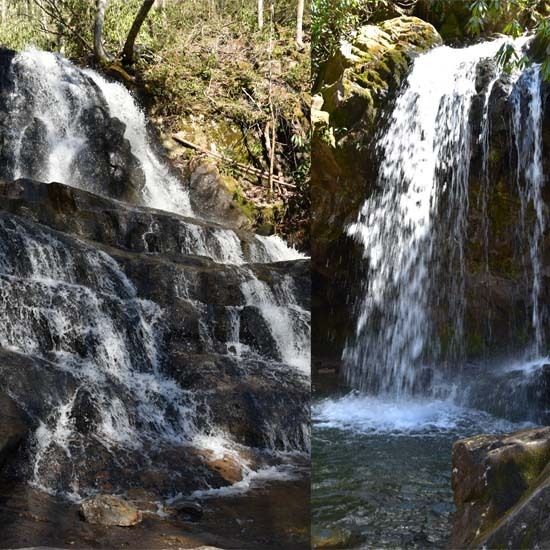 But the Great Smoky Mountains did not happen out of my love of National Parks. It happened because that was the place decided for a mini reunion of our college friends from twenty years back. It happened millions of whatsapp chats, several hangout sessions late in the night and couple of Google spreadsheets later. Each hangout was peppered with more serious issues than the last. Luchi or eggs and bacon at breakfast? Pathar manghso on Saturday or bbq? Cookies with tea or muri-chanachur? Pasta for kids or Maggi? Yes we are very focused like that. Finally a beautiful 8 bedroom chalet in the mountains was booked, food items from goat meat to mustard oil, maggi to maacher chop were packed, and we were all ready for the 12 hour long drive to Tennessee. If I am honest my first impression of the Smokies as we entered Pigeon Forge was that of deep disappointment. I had Yellowstone and Grand Canyon on my mind and had not expected traffic jams and departmental stores from Wal-Mart to Macy's at the throes of a national park. The fact that we reached on a Friday which was a holiday could have contributed to the throng of crowd. Once we managed to cross all the traffic lights and crawl onto the mountain roads, the traffic peeled off and feel of the forest came back. The path up the mountains had several switchbacks and took scary sharp turns. The trees grew closer and the air turned crisp. My faith in national parks was restored. It was early spring and the trees were mostly bare except for the light green haze of budding new leaves and splashes of spring flowers here and there. After going through a couple of wrong turns and several phone calls to friends who were already at the chalet, we finally reached the house with a truly "breathtaking view". 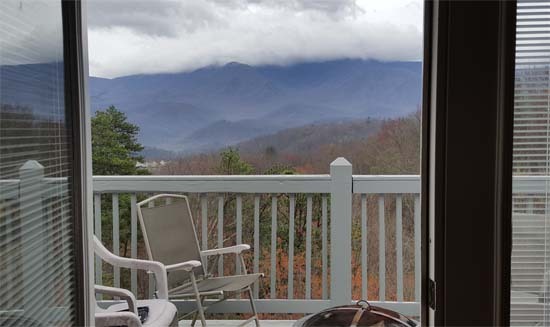 The Mountains rose right across from the house, its peaks swirled in the typical bluish haze that is quintessential to Smokies. It was much fun meeting friends after so many years, getting to know their kids, the better halves and generally indulging in what we call in Bengali as "bhaat" -- meaningless banter. Food and adda were the focal points in the backdrop of the mountains. 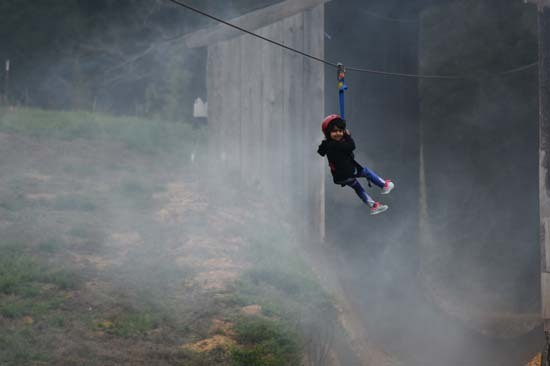 It was fun to see the kids bond with their new friends and have a great time of their own. While we were discussing the menu in the days leading to the trip, and trust me it would always end up without a consensus, there was the question of how to cook the goat meat. Should we carry a Pressure cooker ? Will the kitchen have a large enough heavy bottomed pan to cook goat meat for twenty people ? Will Donald Trump be the president ? Should we move to Canada ? You know that kind of questions on which no consensus can be ever reached. 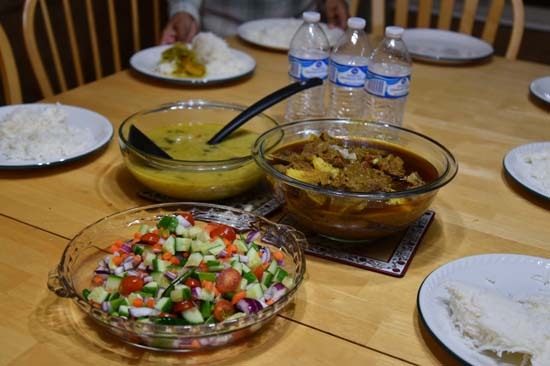 At this point when everyone was arguing over chat and not really listening to anyone else, our friend from Ohio, Deepshikha said, "We will do the Panthar Mangsho(Goat Meat curry) in the oven. You don'y need anything else except for a largei-ish aluminum tray". This was so profound that we all just stayed quiet until I mustered to courage to ask "if it tasted good". I shouldn't have. Asked that is. Deepshikha and Biplab are trailblazers in Ohio, investing a lot of time and effort in their local community, doing Durga Pujo and throwing lavish parties with tons of food. They KNOW how to cook mutton in oven and make it taste as good as kosha mangsho.